“Single atomic layers of different oxides are stacked, creating a material with electronic properties which are vastly different from the properties the individual oxides have on their own”, says Professor Karsten Held from the Institute for Solid State Physics, Vienna University of Technology. In order to design new materials with exactly the right physical properties, the structures were studied in large-scale computer simulations. 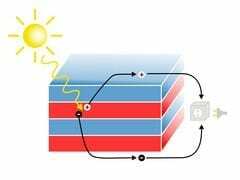 As a result of this research, the scientists at TU Vienna discovered that the oxide heterostructures hold great potential for building solar cells. The basic idea behind solar cells is the photoelectric effect. Its simplest version was already explained by Albert Einstein in 1905: when a photon is absorbed, it can cause an electron to leave its place and electric current starts to flow. When an electron is removed, a positively charged region stays behind – a so called “hole”. Both the negatively charged electrons as well as the holes contribute to the electrical current. “If these electrons and holes in the solar cell recombine instead of being transported away, nothing happens and the energy cannot be used”, says Elias Assmann, who carried out a major part of the computer simulations at TU Vienna. “The crucial advantage of the new material is that on a microscopic scale, there is an electric field inside the material, which separates electrons and holes.” This increases the efficiency of the solar cell. The oxides used to create the material are actually isolators. However, if two appropriate types of isolators are stacked, an astonishing effect can be observed: the surfaces of the material become metallic and conduct electrical current. “For us, this is very important. This effect allows us to conveniently extract the charge carriers and create an electrical circuit”, says Karsten Held. Conventional solar cells made of silicon require metal wires on their surface to collect the charge carriers – but these wires block part of the light from entering the solar cell. Not all photons are converted into electrical current with the same efficiency. For different colors of light, different materials work best. “The oxide heterostructures can be tuned by choosing exactly the right chemical elements”, says Professor Blaha (TU Vienna). In the computer simulations, oxides containing Lanthanum and Vanadium were studied, because that way the materials operate especially well with the natural light of the sun. “It is even possible to combine different kinds of materials, so that different colors of light can be absorbed in different layers of the solar cell at maximum efficiency”, says Elias Assmann.